People born specifically on the 4th of February are believed to have an adventurous purposeful spirit along with their typical slightly eccentric Aquarian nature. The planet that rules this particular day astrologically is Uranus which also determines all water bearer personalities. If you have this birthday the double influence of this celestial body gives you strong individualistic and humanitarian traits. Your quirkiness is coupled with excellent self discipline, a good memory and powerful concentration skills. You possess your own unique way of thinking and doing things and will often come up with innovative ideas. 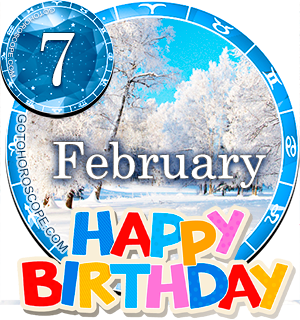 Individual's with a February the fourth birthday are highly responsible and have a moralistic outlook. You can also be a bit of a workaholic and may find it difficult to switch off and relax. This does not seem to deter you from seeking someone special to love who has similar interests and views to share your life with. Work is considered quite a high priority to a person born on the fourth of February. Your altruistic concern for human welfare will usually determine the kind of job you choose although you are capable of almost any occupational tasks. Individuals with this particular birth date need to feel useful and valued when working. You realize the importance of finances but do not let this dictate your occupation choice. Managing financial matters comes easily to you and so you are able to get by on any level of income. You are also adept and disciplined at saving rarely needing to borrow or acquire credit. For an Aquarian, the person born on the fourth day of February is conventional in their seemingly aloof and somewhat cautious approach to romantic involvements. You consider friendships to be very important and generally search for more intellectual unions than emotional ones. Even though you are wary of sacrificing your independence you yearn for the warmth, understanding and security of a long term personal relationship. Many potential partners will often fail to live up to your big expectations and this can mean that it takes a while for you to settle down. In a long term trusting partnership your soul mate lover will be exclusively privy to your intensely passionate and thoughtful side. Once fully committed to somebody you are likely to be extremely loyal and supportive and your own needs will normally take a back seat. Possible problems with health experienced by those born on February 4th are usually connected to your over active lifestyle. You like to keep busy and at the same time you hope to look as young in body as you are in mind. People born on this day often enjoy challenging their physical endurance levels and may be especially keen on keeping fit but should watch out for muscle strains to which they are prone. You love to be knowledgeable about the latest developments in how to maintain healthiness through the right foods and exercise. An enjoyment of food and cooking is another of your fortes that will help your vitality. Your main strengths of character are highlighted in your bold liveliness, sincerity and purposive attitude. These characteristics and your independent thought and slight eccentricity help you progress and cope well with the majority of life circumstances. Being unrealistic and behaving erratically are the major weaknesses of the personality noticed for those born on February 4th. These negative sides to your individuality are mostly evoked when you have things on your mind or upset by something or someone. Your reactions in these situations are often short lived but they can be alarming to others. Being born on the 4th of February usually means that you will have an abundance of dreams and goals due to your resolute and adventuresome manner. Your desire to help others and fill your life with activity and companionship helps you easily decide life directions and aspirations. However many hopes and aims you have for the future they will probably include the longing for a secure loving relationship. Although not always obviously apparent this is ordinarily one of your biggest wishes to make your life feel complete. You are also inclined to come up with many of your best ideas when dreaming. As you were born on the fourth day of the month the digit Four is designated as your special birthday Root number. This numerical reference to your day of birth has the keyword 'Honesty' and emphasizes your sense of responsibility and conscientiousness. The Tarot card most associated with your birthday is the 4th in the Major Arcana, the Emperor, it reveals your bold and steadfast approach to life. The luckiest gem for February the fourth birthdays is considered to be Topaz. This precious stone should be worn or carried for an added air of confidence, calm or creativity and for an increase in luck. All Aquarians are thought to be astrologically influenced by the cosmic forces of the planet Uranus and you are no exception. However, the actual day you were born on, the fourth of February is also dominated by this planetary influence duplicating its impression on your personality. This creates and explains your large amount of spirited energetic individuality and your kind compassionate mannerisms. It also endows you with the ability to concentrate intensely and organize effectively. These attributes and your caring, unconventional and inventive thought can assist in making anything you set your mind to happen. Knowing yourself better and laughing and relaxing a little more should help you make emotional interactions easier. A final thought for people born on February the 4th is to try and not let worries build, sharing and talking about them is advised. Amazing I've been described to a T.
True abt me.... everything! ! OH my Uranus! its so so so so true!! !